This content is presented in partnership with SkillShark Athlete Evaluations, the most modernized and affordable app for athlete evaluations and tryouts in any sport. Max is a 13-year-old baseball player who is gearing up for his tryouts for the local little league team. Although he played for this same team last season, he has noticed that he is becoming more and more stressed as the tryouts draw near. Although day one goes okay, he complains that he is sick to his stomach before his second session. He has trouble remembering the drills from time to time, which is unlike him. He missed an easy pop fly early in the exhibition game and bobbled each grounder that came his way. You’re starting to wonder – what is going on? Mental health, as a whole, is being discussed in the media more and more within the last few years. Athletes such as Michael Phelps, Kevin Love, and Demar DeRozan have championed these efforts, which have helped make great strides in the athlete community. The long-standing stigma around depression and anxiety continues to shrink. Despite this, athletes of all ages still experience challenges with their mental health. Exercise can be extremely beneficial for people with anxiety and depression – some studies show it’s as effective as medication! Despite these facts, athletes still struggle with their mental health as much as the rest of the population. In my experience working with junior hockey teams, it’s very common to have four or five players on the team with mental health struggles. 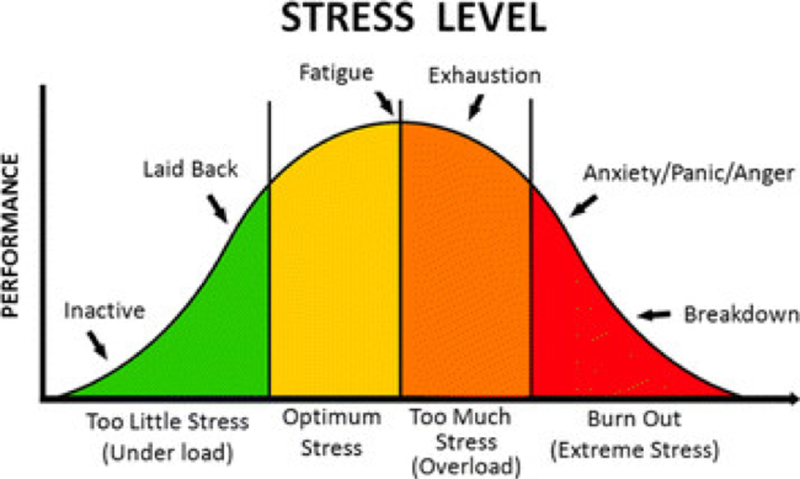 Stress and anxiety are very common in sport; in fact, we know that having an appropriate level of stress before a game or a tryout helps us perform better. The important question is: When does too much stress become a negative instead of a positive? Let’s take a look at the chart below. The yellow bar represents the optimum level of stress in order to achieve the best performance – not too much, not too little. When we don’t have enough stress (lost interest in the sport, lack of motivation, etc.) we don’t have enough adrenaline pumping to sharpen our senses to where they need to be in order to perform. As we go into the orange and red zones, we run into the risk of running the tank empty – and quickly. This is often where we see athletes who are burned out and have difficulty coping with the stress that they feel. Depression and anxiety show themselves differently in sports than they do in everyday life. This makes it a little more challenging to identify – but hopefully we can give you some things to keep an eye out for. Anxiety is sports is broken down into three main categories: Somatic, Worry, and Concentration Disruption. This is based off the Sport Anxiety Scale-2 which has been shown in studies to be effective at identifying anxiety in athletes. Think of these more as physical symptoms. Does your body feel tense? Does your stomach feel tense? Do your muscles feel shaky? Does your stomach feel upset? Do your muscles feel tight because you’re nervous? Do you worry that you won't play well? Do you worry that you will let others down? Do you worry that you will not play your best? Do you worry that you will play badly? Do you worry that you will mess up during the game? Is it hard to concentrate on the game? Is it hard for you to focus on what you are supposed to do? Do you lose focus on the game? Do you have trouble thinking clearly during the game? Do you have a hard time focusing on what your coach tells you to do? Do you still get excited when you succeed? Do you feel down, depressed, or hopeless? Do you get too much or too little sleep? Do you still enjoy spending time at the rink/field/etc.? Do you feel like you’re a failure or have let yourself/your family down? Do you feel that you don’t have enough energy to get through a practice or a game? Note: Athletes may also complain of difficulties with concentration, appetite, fidgeting or the inability to sit still. If anyone ever states that they are having thoughts of suicide or self-harm, go to the Emergency Department or see a physician immediately. These questions are meant to be a guide to help discussion around anxiety and depression. If you notice one of your athletes answers yes to several questions, continue the discussion with them, their coach, their parents and their team/family physician. Answering yes to one or two questions is not necessarily an indicator that something is wrong, but this depends on each athlete and the conversation you have with them. The best thing you can do in these cases is to support them and have open dialogue about what they’re going through. Help our athletes stay in the yellow zone, where they can thrive both as athletes and people. I encourage you to check out two articles written for the Players Tribune. Gerald McRath, retired NFL linebacker and Nick Boynton, retired NHL player both discuss their own personal stories and shed light on mental health within professional sport. Coaches, parents, teammates – ask your athletes if they’re doing OK, and set them up for success both on the field and off it. SkillShark is the most user friendly evaluation app, where coaches use pre-built or customizable templates to set up evaluations for any sport! Evaluators use a mobile app to score athletes and at a click of a button full information, rating and rankings are made available to coaches.